What Else Can I Expect From an Online Associate in Network Security Program? What Are The Best Online Associate in Network Security Programs? What Can I Do With an Associate in Network Security Degree? Modern computer networks are remarkable tools for communication and collaboration, but they also are rife with vulnerabilities, and frequently exploited through hacking, viruses, identity theft, and fraud. A network security degree puts you at the forefront of the fight against cybercrime, and trains you to secure computer networks and protect them against unauthorized intrusions. The increased threat of cyberattacks has created a massive demand for information security analysts, and the Bureau of Labor Statistics projects the field to grow by 18% between 2014-2024. 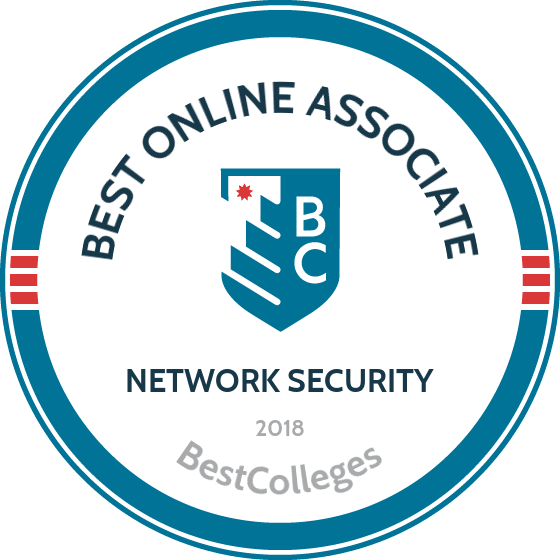 If you're interested in pursuing a network security degree online, the schools in this ranking represent some of the top programs in the country, combining affordability, convenience, and academic excellence. 1.5 to 2 Years to completio. 60 credits total/30 credits per yea. Accrediting Board for Engineering and Technology (ABET. MWCTC’s associate degree in information security assurance teaches you how to assess and secure information systems and networks. The 60-credit online program prepares graduates to perform audits and address breaches in order to bring networks into full security compliance. While earning the online associate degree in network security, you will study operating systems, IT customer service, data security awareness, and computer forensics. One noteworthy course is ethical hacking, which is about counteracting the tools hackers use to enter networks. Admission requirements include a high school diploma or equivalent. Paying for college at MWCTC is made possible through affordable tuition, financial aid such as scholarships and grants, and payment plans for eligible students. MWCTC has articulation agreements with a number of four-year colleges. CTC offers distance learning that is convenient and flexible, with several campuses in Texas and additional educational opportunities at 25 military installations across the United States. Among the school’s catalog of online degree programs is the associate degree in information security. The 60-credit program produces IT professionals who are able to protect valuable information stored on company computer networks. Study areas include IT Security (CompTIA Security+), systems maintenance, incident response, using project management software, and security management practices. Students in the network security degree program take a three-credit internship that provides a hands-on application of course content. Classes are delivered through Blackboard. CTC’s online learners have access to support services such as academic advisors, disability services, tutoring through Academic Studio, and an advanced math lab. Admission to the program requires a high school diploma or its equivalent. The school has extensive experience working with military personnel who want to earn a degree. UMFK’s AS in information security prepares students for entry-level positions in information security and related fields, or serves as a pathway to a baccalaureate degree. The 60-credit program includes 29 credits in general education requirements along with major-specific courses in information security, networking, operating systems security, cryptography, and cyber defense. Upon graduating, students should know how to effectively complete projects in information security; how security concepts function in society at large; and how to work as a team to achieve specific outcomes. Among the career options for graduates of this network security degree include computer security specialist, information security administrator, and information security program director. Admission requires a high school diploma or GED. The school is highly affordable, and active military personnel qualify for in-state tuition. Texas-based St. Philip's College offers an associate degree in information assurance and cybersecurity, a 60-credit program that teaches you to design and secure computer networks. Graduates of the program will know how to install security software, address cyber attacks, monitor networks for security breaches, and gather evidence that can be used in criminal prosecutions of cyber crimes. Courses in the online network security degree include networking fundamentals, IT security, Linux installation and configuration, computer virtualization, and computer systems forensics. Note that some courses in this program are approved by the National Security Administration and and the U.S. Department of Homeland Security. The online associate degree in network security is delivered via Canvas. Online students also have access to online tutoring, tech support, and technical training. Students interested in a career in cyber security can enroll in GMC’s online AS in cyber security. The program focuses on four areas: desktop programming, networking, data structures, and cyber information security. The curriculum requires mastery of these core subjects, making students highly marketable to companies seeking professionals with advanced technical skills. The fully online curriculum also includes core courses in areas such as math, the humanities, and natural sciences to facilitate transfer into baccalaureate programs. GMC has a large number of articulation agreements with four-year colleges around the country, ensuring a seamless transfer of credits into a bachelor’s degree. Admission into the online associate degree in network security requires a high school diploma, technical diploma, or its equivalent. Among the school’s notable features are textbook rentals and a low, flat-rate tuition. An online associate degree in network security prepares you for a range of IT and digital security positions, from network administration to network security to technical support. Generally, these positions require you to develop and maintain network systems, monitor their operation, and assist other employees with network troubleshooting and operations. To succeed in network security, you need problem solving skills, attention to detail, communication skills, and knowledge of the latest developments in networking technology. By supporting IT employees within an organization, network support specialists assist with networking software and hardware. While an associate degree is often adequate for these positions, some employers prefer a bachelor's degree. These employees protect networks and computer systems against cyberattacks and other unauthorized intrusions. More advanced analysts may also design network security systems and protocols, though these higher-paying positions usually require at least a bachelor's degree. Systems administrators perform the vital work of maintaining day-to-day operations of computer networks. They manage system organization and address networking problems as they arise, ensuring a network's functionality. Many colleges allow you to apply transfer credits from your online associate degree in network security toward a bachelor's degree, which can increase your career options and your earning potential. Depending on the school and the degree you pursue, you may be able to complete your baccalaureate network security degree with less than two years of additional study. Many higher-level positions in the field, such as cyber security analysts or network security engineers, typically require at least a bachelor's degree. This degree emphasizes investigating and preventing cybercrime, and examines the field from both a technical and legal perspective. Coursework includes data analysis, digital evidence and forensics, and network intrusion detection. Information Assurance: Students in these programs develop strategies for safeguarding digital information at businesses and other organizations. The degree highlights the design and maintenance of digital information systems and safeguards. IT Network Administration: The network administration degree prepares students for careers as network server administrators, overseeing network development and management for businesses. This comprehensive degree includes topics in data management, security, programming, operating systems. Along with experience and education, location also has an impact on average salary for graduates of online network security degree programs. The following table collects data from the Bureau of Labor Statistics, showcasing the differences in median salary by U.S. state. The highest-paying states are on the East Coast, with California rounding out the top five. Network security professionals have several options to participate in trade groups and associations. Many organizations offer membership opportunities to both students and working professionals, allowing access to resources such as workshops, conferences, professional certification training, career services, and networking opportunities. Joining one or more of these organizations is a great way to develop professionally, and to pursue greater opportunities for your career. Boasting more than 10,000 members worldwide, ISSA is dedicated to supporting industry professionals in the management of digital security risks and the protection of IT infrastructure. The organization offers conferences, certification options, and a trade journal that covers the latest industry trends. AITP is a global society for IT professionals, and offers conferences, local chapter meetings, scholarships, career counseling, and a strong spirit of networking and community. The group features more than 4,500 members in the U.S. alone. A nonprofit trade association, CompTIA advances the interests of IT and security professionals around the world. Members take advantage of professional development seminars, technical education, certification and training, conferences, and business credentials, along with significant networking opportunities. Earning a network security online degree is certain to increase your earning potential, but it's still important to understand the different options for financing your education. One of your first steps should be to complete the FAFSA, which determines your eligibility for federal funding sources such as grants, scholarships, work study opportunities, and loans. Online research can also help you locate scholarships specifically intended for students pursuing network security degrees. Other funding opportunities may be available for students with certain backgrounds or who are pursuing certain career paths.